Our loving mother, grandmother, and great-grandmother, Genevieve H. James, age 90, succumbed to breast cancer Feb. 4, 2019, surrounded by her family. She was greeted by Heavenly Father and many loved ones. Genevieve was born in Boise and grew up in Council, Idaho. She was a daughter of Elmer Lewis and Pearl Kathleen Fernan Winkler. She had four sisters. 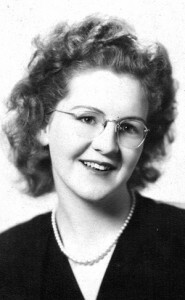 She graduated in 1946, and worked as a nurse for many years in the state of Idaho. She was married once, to Gay R. James. She had three daughters before the two divorced in 1958. She had many hobbies, including gardening, crocheting, reading, food preservation, and genealogy. Genevieve is survived by her daughters, Diana, Deborah (Terry), and Teresa (Cameron); 10 grandchildren; nine and one-half great-grandchildren; and two surviving sisters, Virginia and Janice. She will be greeted in death by three sisters, Virginia, Amy and Mildred. Funeral services will be held Saturday, Feb. 9, 2019, 1 p.m., at the Tooele Overlake Ward Building, 222 W. 2200 North, Tooele, Utah. Friends and family may call prior to the services, from 12–12:45 p.m. Genevieve will be laid to rest at Tooele City Cemetery, 361 S. 100 East. Funeral services under the direction of McDougal Funeral Home.